The United States Congress designated the Bob Marshall Wilderness (map) in 1964 and it now has a total of 1,062,693 acres. All of this wilderness is located in Montana and is managed by the Forest Service. 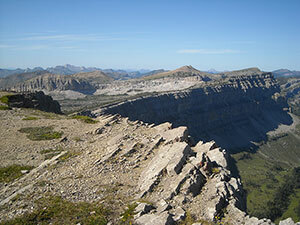 The Bob Marshall Wilderness is bordered by the Great Bear Wilderness to the north and the Scapegoat Wilderness to the south. The Bob Marshall Wilderness Complex Located in Northwestern Montana on both sides of the Continental Divide, this large complex includes three Wilderness areas: the Great Bear, the Scapegoat, and the Bob Marshall Wilderness. Together the Bob Marshall Wilderness Complex makes up an area of more than 1.5 million acres, the third largest in the lower 48 states. Grizzly bear, lynx, wolverine, deer, elk, gray wolf, moose, black bear, mountain lion, mountain goat, and mountain sheep roam about these rugged ridge tops, gently sloping alpine meadows, thickly forested river bottoms and open grass parks. Across this continuous landscape over 1700 miles of trail provide challenges and experiences to satisfy visitors with a wide range of skills. The Bob Marshall Wilderness was named for Bob Marshall, the early wilderness advocate, explorer and conservationist who promoted the development of effective and meaningful wilderness management. Designated in 1964 with the passage of the Wilderness Act, the Bob Marshall Wilderness is the oldest of the three wilderness areas composing the BMWC. It is also the largest, covering 1,063,503 acres on the Flathead (Spotted Bear Ranger District) and Lewis and Clark (Rocky Mountain Ranger District) National Forests. There are approximately 1,100 miles of system trail in this wilderness. Much of the area now comprising the Bob Marshall Wilderness was originally protected as the South Fork, Pentagon and Sun River Primitive Areas, which were established in 1931, 1933, and 1934 respectively. In 1978, additional lands were designated in the Birch Creek area. Then in 2014, additional lands were designated along the Rocky Mountain Front bringing the Bob Marshall Wilderness to its current size. The Continental Divide separates the Bob Marshall Wilderness into the Flathead and Sun River drainages, with elevations ranging from 4,000 feet to more than 9,000 feet. A huge escarpment called the Chinese Wall, is one of the most spectacular features of the landscape, averaging 1,000 feet in height and extending 22 miles. East of the Divide, the mountains of the Rocky Mountain Front rise from the plains, with elevations of 2,000 to 8,000 feet, and extend over 60 miles from north to south along the eastern edge of the Wilderness area. This wilderness area is host to the popular Wild and Scenic South Fork of the Flathead River as well as the many lakes, concentrated in the South Fork drainage, including the largest in the BMWC, Big Salmon Lake (972 acres). Planning to Visit the Bob Marshall Wilderness? How to follow the seven standard Leave No Trace principles differs in different parts of the country (desert vs. Rocky Mountains). Click on any of the principles listed below to learn more about how they apply in the Bob Marshall Wilderness.